I first wrote about Han’s Restaurant when I started this blog a couple of years back. At that point, Han’s was under new ownership and I was really sad that the food was not as good as it once was when the original owners were at the helm. I can’t tell you how ecstatic I was when I learned last October that the original owners were back running Han’s. I’ve been going there almost every week (and sometimes even multiple times in a week) ever since for my spice fix. Though I grew up eating Cantonese food (which is not spicy at all), somewhere along the way I developed a taste for spice and it’s almost become an addiction for me now, especially during the cold, winter months. Han’s is a tiny eatery with only about eight tables and is located inside the City Plaza strip mall in the heart of Calgary’s Chinatown. They serve up both Taiwanese and Szechuan fare. 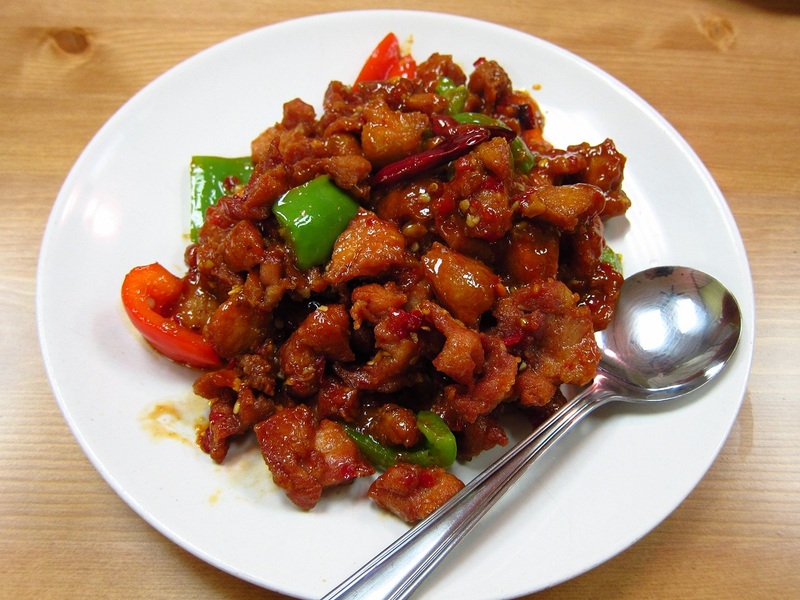 Note that their Szechuan fare is stylistically different from the authentic Szechuan (Sichuan) fare one might get from restaurants like Szechuan Restaurant or Delicious Country. I would consider Han’s style to be Taiwanese-influenced Szechuan cuisine. Taiwanese-Szechuan cuisine is actually quite unique and hard to find so we are very lucky to have one such restaurant in Calgary. In the whole Vancouver metro area, the only Taiwanese-Szechuan place that I’m aware of is Kalvin’s Szechuan Restaurant. This post is a cumulation of my many visits to Han’s over the past half a year. Over the countless visits, I’ve pretty much tried every dish on their menu that I would want to try. I’m not usually a fan of offal so there are a few items that are off-limits to me. One of my all-time favourite dishes at Han’s is #4. 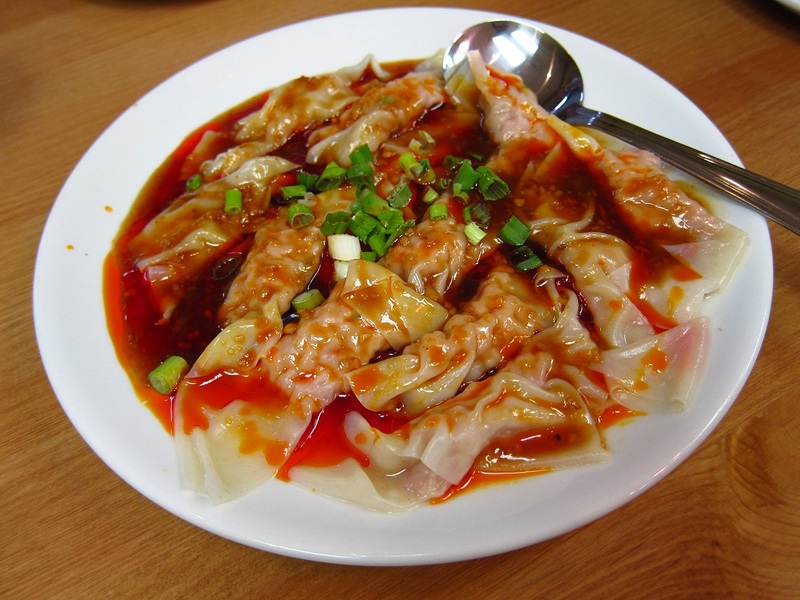 Wonton with Spicy Sauce ($10.50). The wontons are topped with a housemade garlic chili oil. This dish isn’t as spicy at it looks. Instead, it is very garlicky. I would say this is one of the “milder” spicy dishes at Han’s. I totally fell in love with this dish ever since I tried it for the first time. I know that not everyone is as crazy as this dish as I am. There are some that are like me and are totally addicted to this dish while others think that it’s just ok. For me, this is a must order item at Han’s and I actually have cravings for it. I’ve also tried #5. 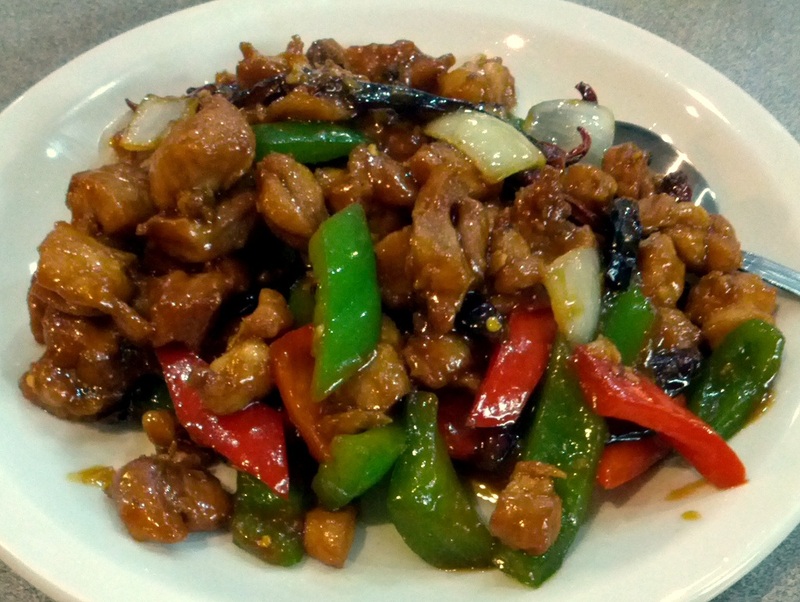 Kongpao Chicken ($13.50). This dish consisted of chicken stir fried with chilis and peppers. It was executed well but wasn’t as spicy as we had hoped it would be. Next is the #7. Chicken with Spicy Sauce ($13.50). I wasn’t exactly sure what to expect for this dish. The Chinese name for this dish is La Zi Ji (辣子鸡), which is the same name as the dish that I had at Delicious Country, and Szechuan Restaurant, as well as countless number of authentic Szechuan restaurants in the past. At all these other places, the dish always consisted of dry fried chicken and tons of chilis. This version at Han’s is slightly different as the chicken is tossed in a spicy sauce. This was one of the few times where the English translation for the dish was actually a more accurate description. To be fair though, the menu did not specify which style of La Zi Ji. I just assumed it would be the Szechuan (Sichuan) version since Han’s serves Taiwanese-influenced Szechuan cuisines. 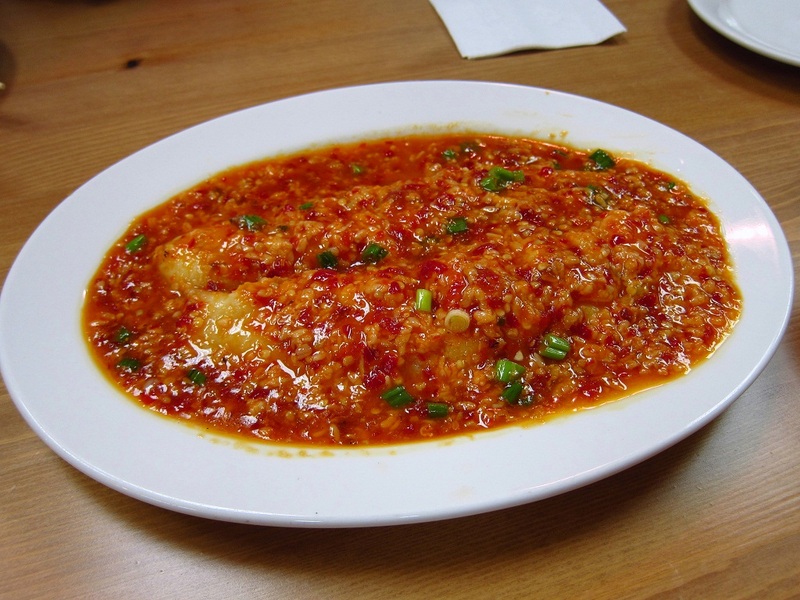 This version with the spicy sauce is actually the Hunan-style La Zi Ji. Another one of my favourite dishes is #9. 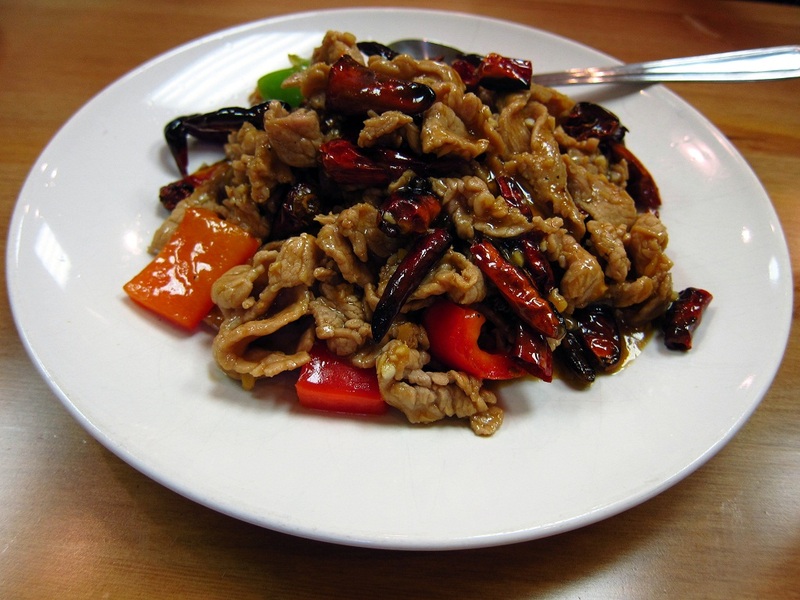 Stir Fried Pork with Topan Sauce ($13.50). This dish is often known as Twice Cooked Pork or Huí Guō Ròu (回锅肉). This is another classic Szechuan dish. The dish is called Twice Cooked Pork because the pork belly is first simmered and then sliced into really thin pieces, almost like bacon. 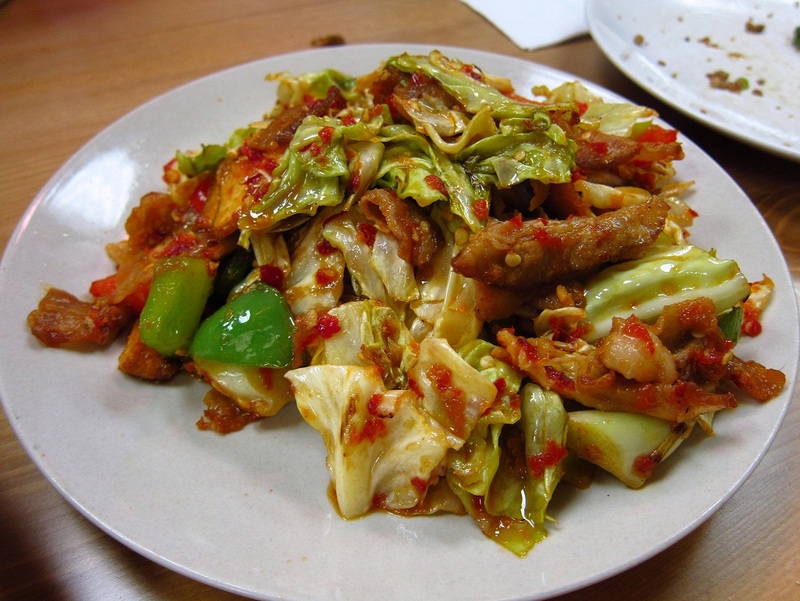 It is then stir fried along with cabbage and peppers in a spicy topan sauce. I had already anticipated that this version would be stylistically different from the version that my coworkers and I had at Szechuan Restaurant, which was done in authentic Szechuan style. 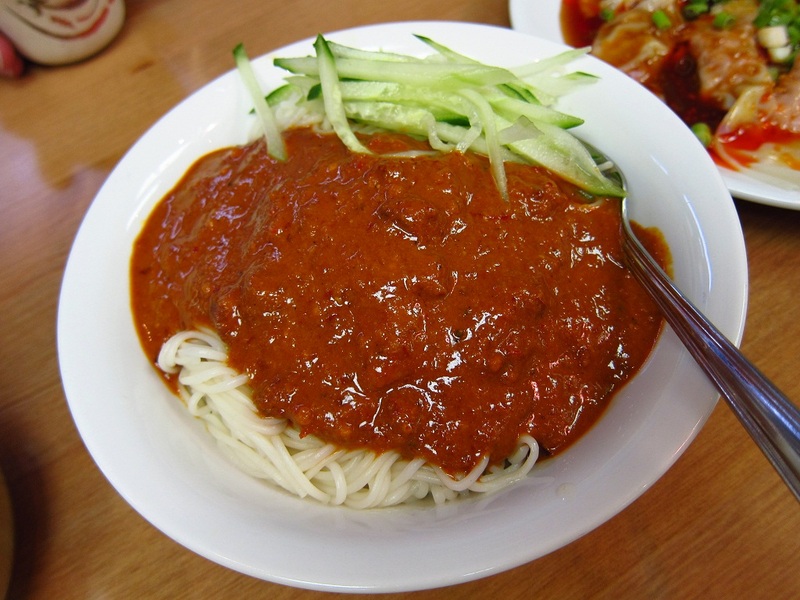 The topan sauce is a Szechuan-style hot bean paste and is used in a number of dishes at Han’s. I like that the cabbage is still slightly crunchy and the flavours of the pork belly can’t be beat. On one of my visits, I tried #13. Kongpao Beef ($14.95). This dish is quite similar to #5. Kongpao Chicken, except that beef is used instead of pork. I like that the beef slices were really tender. However, like the Kongpao Chicken, I didn’t find it to be very spicy at all. Another dish that I really enjoy is the #16. Szechuan Style Oxtail ($16.50). Again, this is one of the dishes that uses the topan sauce (Szechuan-style hot bean paste). I like how tender and flavourful the oxtail is. The only downside is the bones, which you have to eat around in order to get at the meat. On one of my visits, my friends and I had the #19. Fish Fillet in Topan Sauce ($16.50). This is a dish that we order from time to time. It is quite tasty with rice and not as spicy as it looks. 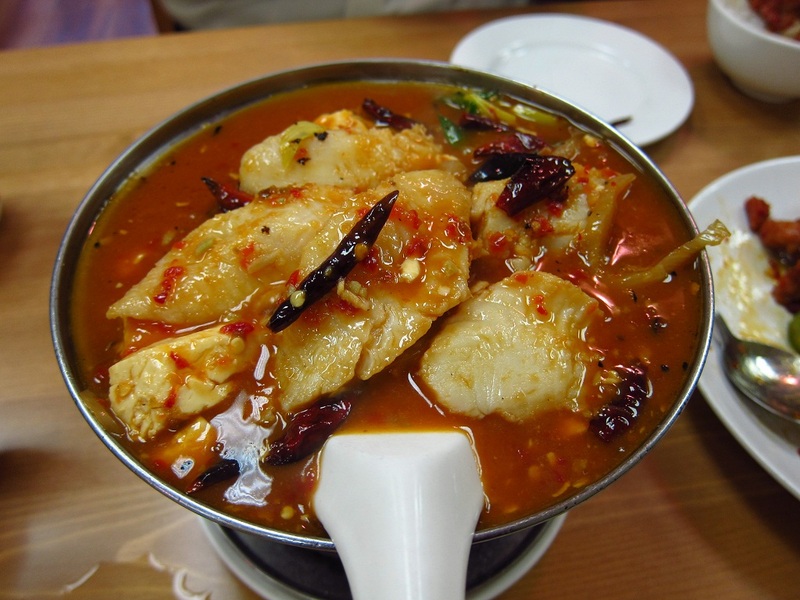 Even though it’s so tasty, my friends and I tend to favour the Spicy Hot Pot Fish instead out of habit and also, because we are addicted to it. This dish, #22. Spicy Hot Pot Fish ($15.50), is the one that actually keeps my friends and I going back for more is. It is better known as Water-Boiled Fish or Shuizhuyu (水煮魚) in Chinese. My first introduction to this dish was actually at Han’s back in 2009. At that point, I had no idea that there are different variations or interpretations of this dish. The version at Han’s is more like a bouillabaisse or fish stew. Since then, I’ve tried various versions of this dish at different Szechuan restaurants in the Vancouver area as well as in Calgary. Interestingly enough, most of them do not resemble the version from Han’s. I really like the complexity of flavours in this dish – the tongue numbing Szechuan peppercorns along with the pickled cabbage and leeks. Of all the versions of this dish that I’ve had, I would say this version from Han’s is by far my favourite. One dish that I recently re-discovered is the #26. Spicy Thin Bean Noodle with Minced Pork ($11.50). This classic Szechuan dish is sometimes known as “Ants Climbing Up A Tree”, which is the literal translation from the Chinese name. 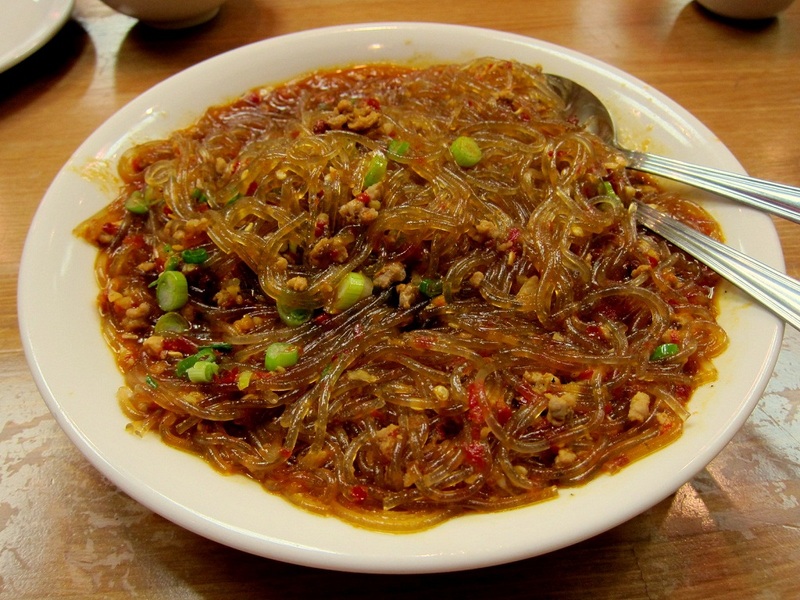 The minced meat clinging on to the bean thread noodles supposedly evoke an image of ants climbing up twigs. I’ll admit that in the past I wasn’t a huge fan of this dish because I didn’t think that the noodles had much flavour. 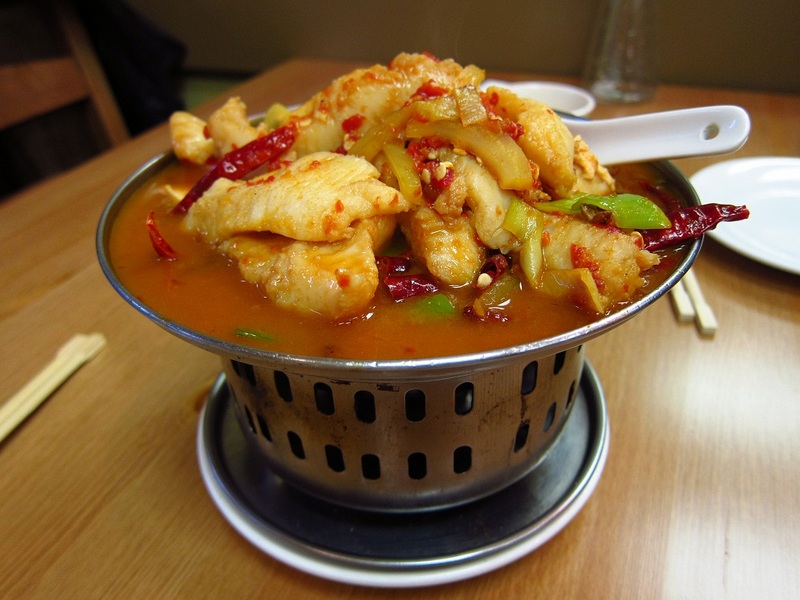 However, since my friend R and I have been ordering this dish “extra spicy”, I’ve totally fallen in love with this dish. When made “extra spicy”, the noodles have so much more flavour to them. It’s gotten to a point now where this dish is almost tied with the Spicy Hot Pot Fish for being the favourite. In terms of vegetable dishes, one of the non-spicy dishes that I really like is the #31. 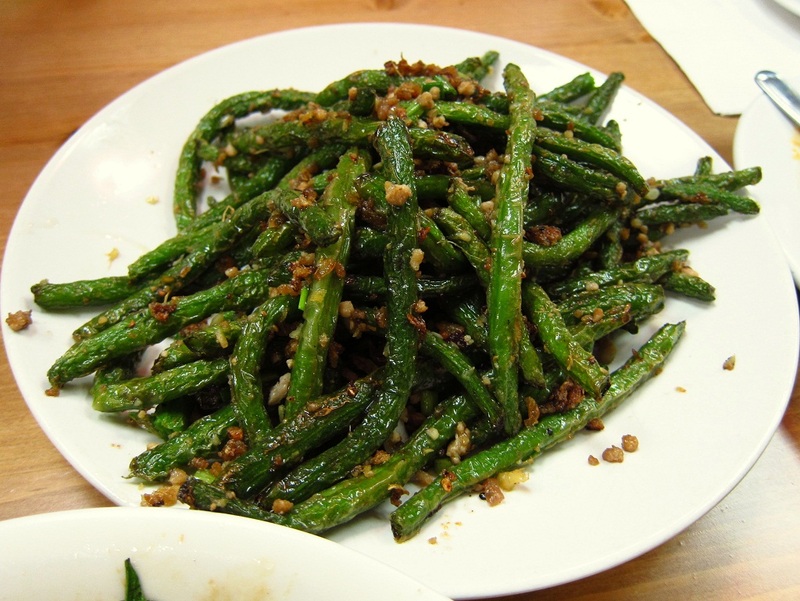 Fried Green Bean with Minced Pork ($13.50). My friends and I order this non-spicy dish frequently to give us a break from the spice in the accompanying dishes. I liked that the beans are fried till they are slightly puckered thought still a bit al dente. The caramelization from the stir-frying really helps to contribute to the flavour. There are actually two eggplant dishes at Han’s that are really well executed. The first is the #32. Eggplant with Spicy Sauce ($12.50). 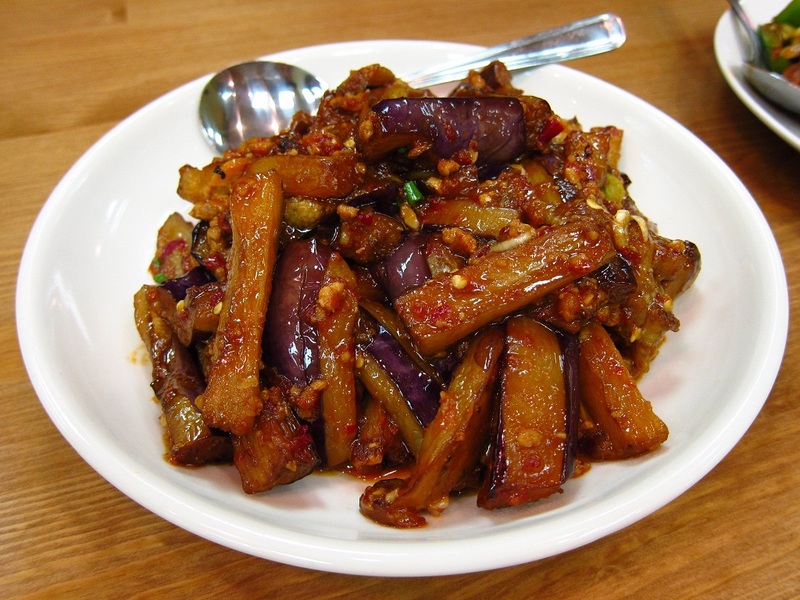 This dish is Han’s interpretation of classic Szechuan dish better known as Fish-Fragrant Eggplant or 鱼香茄子 in Chinese. Despite its common name in both English and Chinese, it actually doesn’t contain any fish. I like that the eggplant is cooked perfectly al dente. I find this dish to have flavours quite similar to the topan sauce. Depending on what the flavours are in accompanying dishes, I order this spicy eggplant dish from time to time if the flavours in the other dishes are not similar to this one. 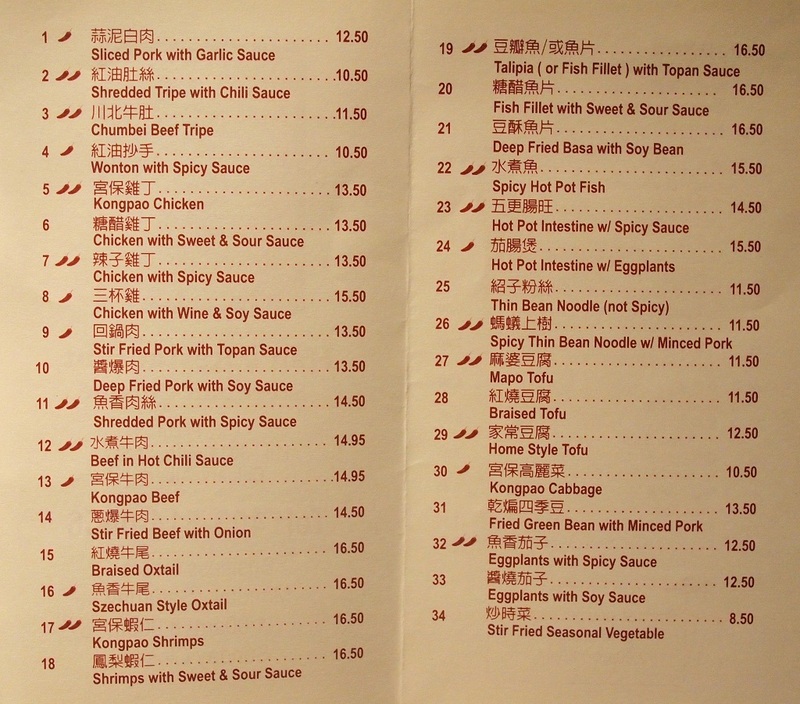 The second is the non-spicy version, #33. 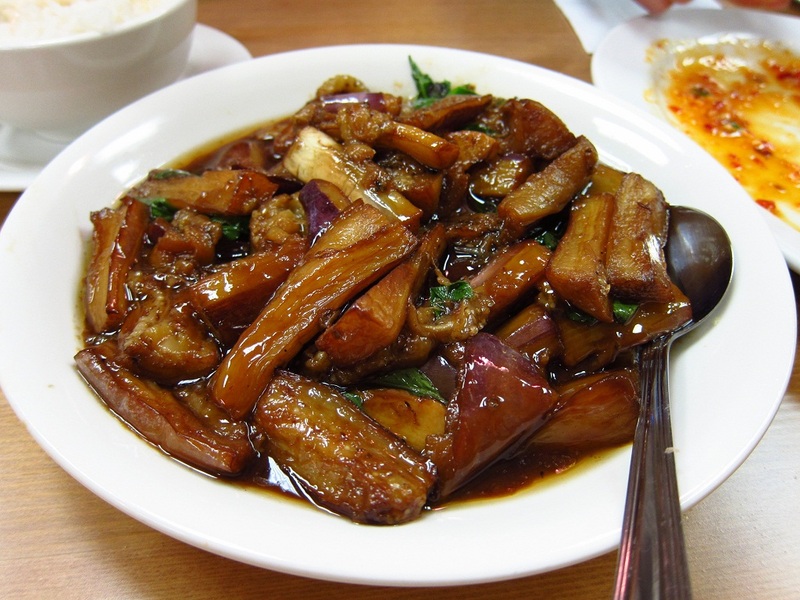 Eggplant with Soy Sauce ($12.50). This is actually one of my favourite dishes at Han’s. I love how they are able to cook the eggplant perfectly al dente on each visit and how hot (temperature-wise) the eggplant is even after it’s been at our table for several minutes. The Thai basil really makes the dish. Without it, the dish doesn’t taste quite the same. I’ve always been amazed at the depth of flavours in the sauce combined with the flavours of Thai basil. My friends and I usually like to order a few non-spicy dishes such as this one to give us a break from eating spice bite after bite. I would say it was this dish back in 2009 that got me to totally love eggplant. Up until that point, I hated eggplant as it was more often than not, mushy and overcooked. 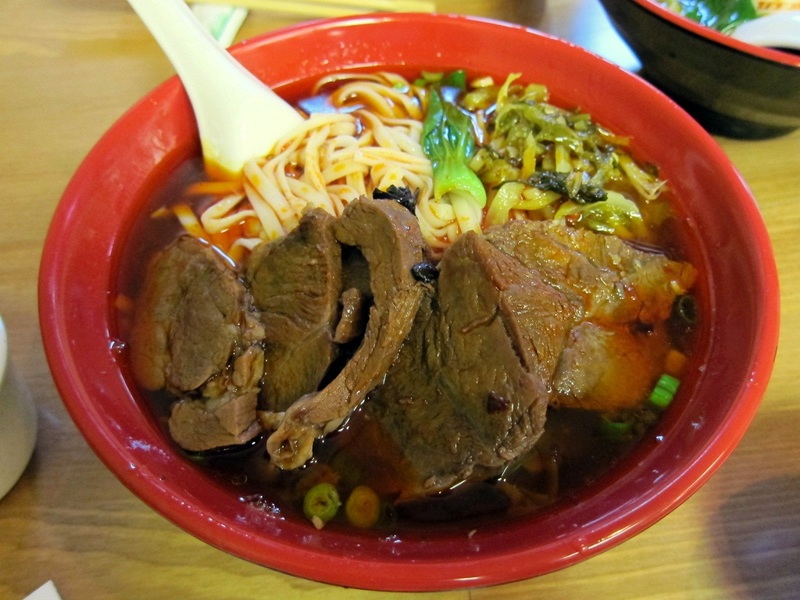 For noodle dishes, I’ve tried both versions of the Taiwanese Beef Noodle Soup. The first (left), is the #35. Spicy Beef Noodle Soup ($9.50). 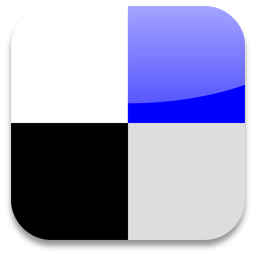 The second version (right), #36. Beef Noodle Soup ($8.95), is the non-spicy one. I still remember the first time we tried these noodle soups. Both my friend R and I had been going to Han’s regularly at this point so our server knew us quite well. When we ordered the Spicy Beef Noodle Soup, she asked whether we were sure that’s what we really wanted as apparently this version is “VERY spicy”. After having the Spicy Hot Pot Fish countless number of times and she knew that was a dish we loved, it made us wonder just exactly how spicy this noodle soup was going to be. She planted enough doubt in my mind that I suggested we order one of the spicy and one of the regular. That way if the heat got way out of hand we could dilute the spicy broth with the regular one. It was a bit anticlimactic when the bowls of noodle soup arrived. After taking the first bite of the spicy one, my friend R and I looked at each other and wondered “Where’s the heat?”. Surely, we must have been missing something as neither of us could barely detect the heat on our tongues. We later learned from the owner that they actually use a different chili oil in this dish than the one for the Spicy Hot Pot Fish and she was a little surprised that we didn’t find it to be spicy at all. Regardless, I’m still not sure why they made a big deal about the beef noodle soup being that spicy. It was actually from this day onwards, we’ve been asking for all our food to be made “EXTRA SPICY!! !” whenever we go. Comparing both noodles soups, I, of course, prefer the spicy version, especially now when they make it “extra spicy” for us. 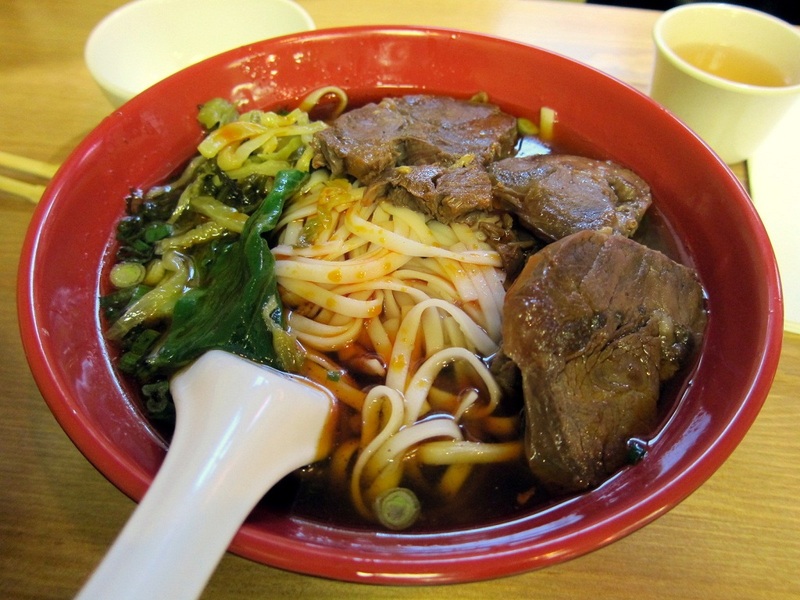 The regular Beef Noodle Soup is still very tasty. The non-spicy broth has a much richer beef flavour. What I really like about both noodle soups is the pickled cabbage. Without it, the dish just isn’t the same. 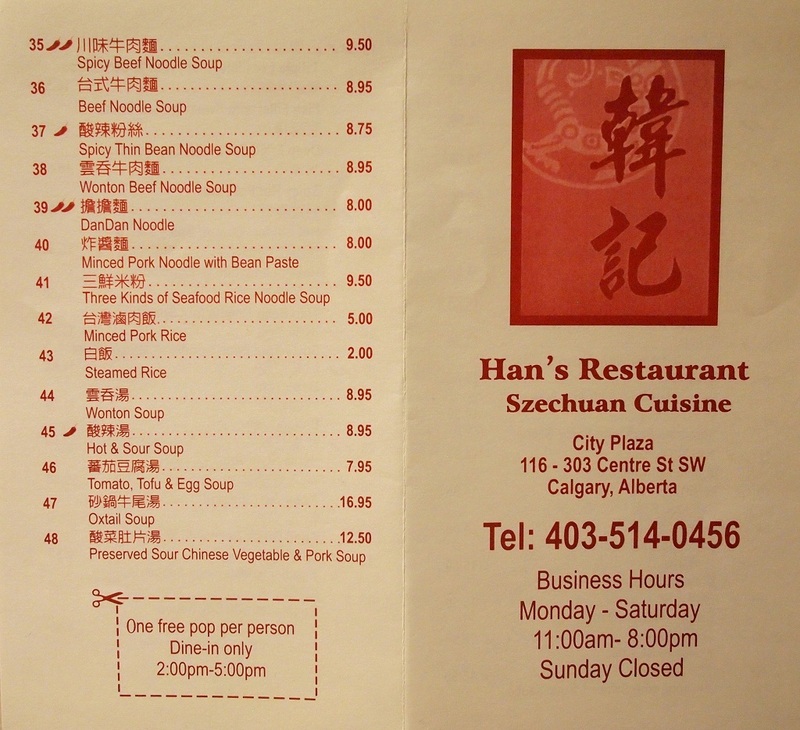 Han’s is one of the few, if not only, places in Calgary where you can get Taiwanese beef noodle soup. Last, but no least is #39. DanDan Noodle ($8.00). Though this may be an authentic preparation, I’ll admit that this is not one of my favourites as Han’s. It’s tastes ok but I find the noodles to be too soft for my liking. I usually prefer my noodles to be more al dente. Also, even with the sauce, I didn’t find the noodles to be that flavourful compared to my favourite dishes. There is no doubt that the current Han’s, with the original owners back at the helm, is a hidden gem and is by far, my favourite Chinese restaurant in Calgary. Whenever my friends and I have a hankering for spice, Han’s is automatically the first place that comes to mind. Most of the dishes are very well-executed and delicious. My favourites are #4. Wonton with Spicy Sauce, #9. Stir Fried Pork with Topan Sauce, #16. 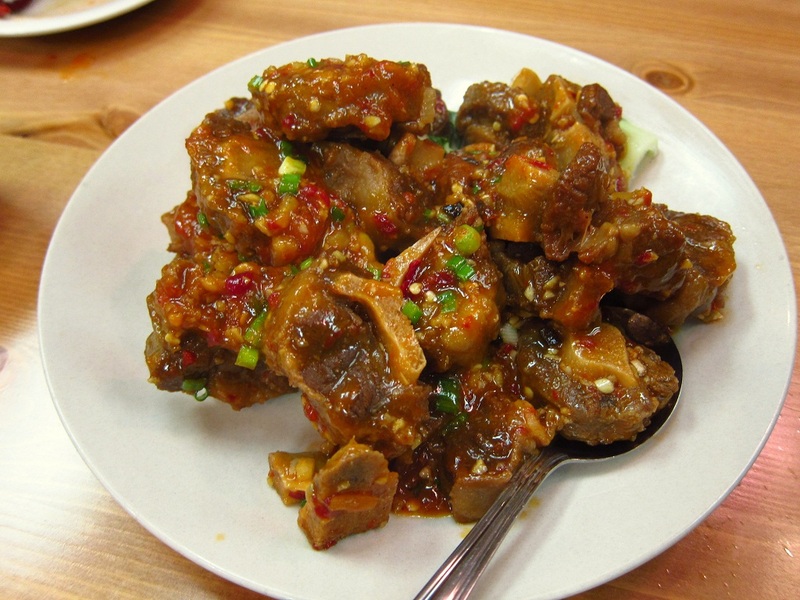 Szechuan Style Oxtail, #22. Spicy Hot Pot Fish, #26. Spicy Thin Bean Noodle with Minced Pork, #31. Fried Green Bean with Minced Pork, #33. Eggplant with Soy Sauce, and #35. Spicy Beef Noodle Soup. We’ve developed such a tolerance for spice from our multiple visits that lately, we’ve always been asking for the spicy dishes to be made “EXTRA SPICY” whenever we go as I find that the heat level in many of their dishes may have been toned down to suit the average patron. This entry was posted in Alberta, Calgary, Chinese, eat, Lunch, Taiwanese and tagged Calgary:, Chinese:. Bookmark the permalink.